The levator scapulae muscle is a very common place to get trigger points, so everyone will have issues in this area from time to time. Common everyday activities can result in these trigger points as well as sports that involve repetitive arm motions such as swimming, baseball, football basketball throwing, and racket sports. Exercises in the gym, like over-head presses, will cause trigger points in the levator scapulae. This relatively small muscle gets overworked by continuously engaging it and sometimes for no apparent reason. Trigger points in this muscle are commonly associated with pain and stiffness in the neck or shoulder-blade (scapula) area. 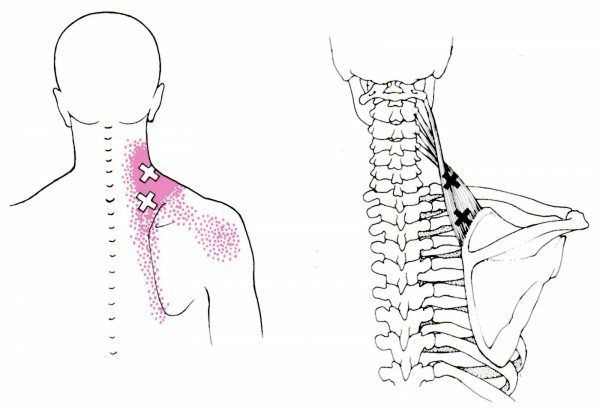 The figure below gives two diagrams showing common painful areas, trigger points, and the anatomy of the levator scapulae. A lower and an upper trigger point are shown. The lower one is near where the muscle attaches to the shoulder blade. The upper one is near where the muscle twists, splits into four parts, and attaches to the top four spinal vertebrae (C1-C4). Even though trigger point reference books don’t show these vertebral attachment areas as potential trigger points, be aware that trigger points do develop there as well. Each body is different. Figure: Rear views with crosses showing common trigger-point locations in the right levator scapulae. (Left) Affected areas shown in pink. (Right) Levator scapulae on the right side of the body. You should be comfortable massaging this area yourself. Massaging these muscles on your own neck is safer than someone else (even a therapist) doing it because you can use direct biofeedback from your own body. This means listening to your body’s signals. Many people think the only way to treat these types of problems is to go to a therapist. And still, because of different reasons, therapists are reluctant to treat sensitive areas like the neck. This makes sense; they cannot understand how your body is responding to their manipulation of your body. Yes, you can communicate to them, but even then it is hard when you are laying on a table relaxed and your mind has checked-out. Active self-massage is when you are actively involved using a mind-body connection; you are not just a bystander where things are happening to you. With active self-massage, you use biofeedback to direct the therapy. You control the duration and the amount of pressure for a muscle trigger point to be released. A more effective release is achieved this way. Be careful, however, if you choose to utilize your fingers to relieve discomfort because repeated force generated over time can cause damage to your finger joints. Especially after middle age, degenerative processes leave the hands more vulnerable to injury, and it is well known that injury can be a precursor to arthritis. The TP BuddieRx was created to prevent that. Using the TP BuddieRx – Here we describe how to release trigger points in the levator scapulae on your left side, but it is good to balance out both sides by doing the same to the other side when you are done. Because the hand positions on the TP BuddieRx are different for each of the two common trigger points, we’ll separate the descriptions into Lower Trigger Point (near where the muscle attaches at the top of the shoulder blade) and Upper Trigger Point (closer to the neck). Lower trigger Point – Begin by using your right hand to hold the TP BuddieRx on S2 with the C-curve facing you. Then hold S1 with your left hand while placing Point 2 of the C-curve on the part of the top of the shoulder blade that is closest to your neck. Your right hand is used for pulling down on the tool to generate the pressure at Point 2 on the trigger-point area, while your left hand is primarily used for guiding. You can also take your right index finger and place it along the top of the C-curve, as if it were an extension of your finger, to fine-tune the placement and massage back and forth or use a press-and-hold action. Upper Trigger Point – Because this trigger point is located underneath the trapezius muscle, here the TP BuddieRx is used to strategically lift the trapezius to access the trigger point as well as to release it. Position the tool as described above for the lower trigger point, but now hold the top of the C-curve with your right hand using Point 2 to get under the trapezius and massage into the sore spot. Alternatively, you can flip around the TP BuddieRx so Point 1 can be used to access the sore area. Hold S2 again with your right hand, and hold the top of the C-curve with your left hand (with the end of the curve pointing downward). It is important to stretch after relieving tight muscles. A good stretch for the left levator scapulae is to tilt your head to the right and slowly turn your head about 30 degrees to look downward. As always, it is best to do the other side as well.